Today, authorities in Walker County, Texas, which encompasses the infamous Karolyi Ranch, announced that the grand jury had returned indictments against Larry Nassar, the former USA Gymnastics team doctor who sexually abused hundreds of women and girls, and Debbie Van Horn, a former athletic trainer who worked with the team (and Nassar) for over two decades. Stephanie Stroud, the assistant district attorney, said that their office first received word of the allegations in 2016, not from anyone at USA Gymnastics but from Michigan Child Protective Services. They began their investigation at that point, joining the many other agencies that were by then already investigating Nassar’s crimes. Stroud said they spoke to eight victims who said that they were abused at the Ranch. Indictments were returned for six of them. Stroud believes that there are very likely more victims that the office hasn’t yet heard from. The Walker County grand jury indicted Nassar on six counts of sexual assault of a child, which is a second degree felony. Van Horn was indicted on one count of the same. The district attorney didn’t say when Van Horn—whose LinkedIn puts her home base in Colorado Springs—will be asked to surrender to Walker County authorities. Stroud said they’ve interviewed many of the key figures in the story including Martha and Bela Karolyi, whom she described as being very cooperative. Rhonda Faehn, the former senior vice president of the women’s program, the D.A. noted, also cooperated. Less helpful was former president and CEO Steve Penny, who was last seen repeatedly pleading the Fifth in a Senate hearing. “He didn’t provide much assistance,” district attorney David Weeks said of Penny. The district attorney’s office, while noting that this was an open investigation, seemed pretty confident that the Karolyis were not going to be charged with any crimes related to Nassar’s abuse of gymnasts at the Ranch. More than once, the DAs said they couldn’t find any evidence to corroborate criminal wrongdoing. They pointed out that Nassar didn’t work for the Karolyis but for USA Gymnatics and that the nonprofit leased part of the Karolyis’ ranch to use for the training camps. “The people who had control over him [Nassar] failed. Simple as that,” Weeks said. From the content and tone of the DA’s remarks, it seems as if the Karolyis are off the hook, at least criminally speaking. The two have been sued by many of Nassar’s victims, though, so their broader legal battle is far from over. 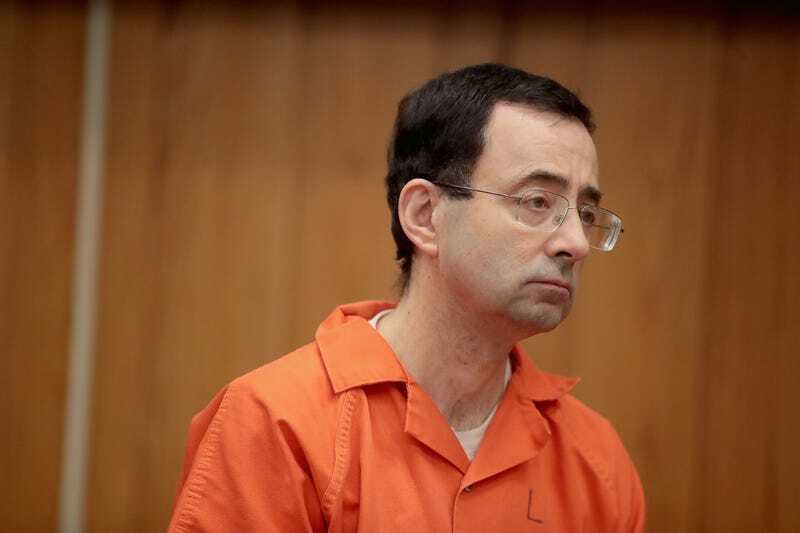 Less pleased with the lack of criminal charges for the Karolyis was John Manly, the attorney who is representing many of Nassar’s victims including Olympian gold medalists Aly Raisman, Jordyn Wieber, and McKayla Maroney.